With so many clean, green lip balms on the market, it takes more than the usual combination of beeswax and shea butter to get my attention. Unconventional flavor combinations attracted me to Ora’s Amazing Herbal Lip Balm. Basil Rosemary, Chai Spice and Earl Grey stand apart from the usual berry-flavored suspects and deliver an infusion of goodness and protection to your pout. Ora’s handcrafted lip balms have a dense feel, meaning the product doesn’t carelessly slide around on your lips. However, the balm has enough slip to it that it’s easy to apply. Take it from a bona fide lip balm addict — not all balms’ textures are created with as much love and care! Herbal infusions — think calendula, comfrey, chickweed, St. John’s Wort, burdock, the works! — aid in relieving chapped and irritated lips while pushing the ingredients envelope. How many times have you picked up a lip balm that costs less than $5 and seen such thoughtful ingredients packed into the tube? I also appreciate that Ora’s Herbal Lip Balms are unsweetened, which keeps me from wanting to lick my lips too much. They are instead subtly scented with therapeutic essential oils and spices. 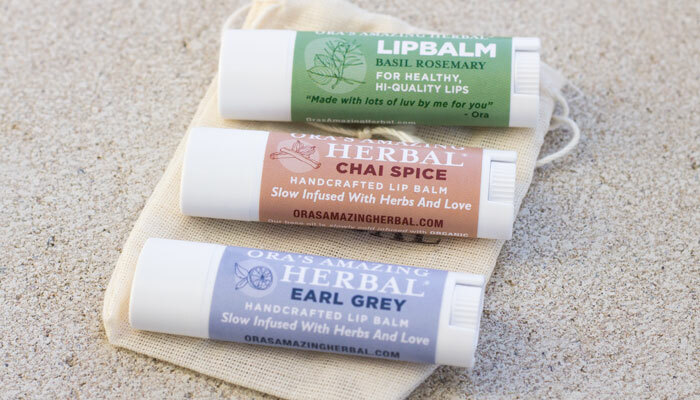 While I chose to try Basil Rosemary, Chai Spice and Earl Grey, Ora’s Amazing Herbal also offers lip balms in Berry-Lime, Clove, Minty Cocoa, Vanilla and Unscented. So, will I repurchase these lip balms? You betcha! I love the soft, pastel packaging as much as I love the healing product inside. Currently, Ora’s Amazing Herbal appears to be available online only. Wholesaling is available — which of my favorite retailers is going to pick up this special line?! Have you heard of Ora’s Amazing Herbal? What do you look for in a lip balm? Tell me in the comments section!